This past November, the new District 26 Toastmaster of the Year for 2012-2013 was selected and it has given me a moment to reflect on my past year as the out-going Toastmaster of the Year. My friend Alan Swartz likes to kid me a bit because he knows I didn’t have a strong grasp of the honor when I was selected. (My Toastmaster journey only started in February of 2010.) For me, it was a special honor to be selected for doing something I love to do…help other people while also growing organizations using my unique set of skills. 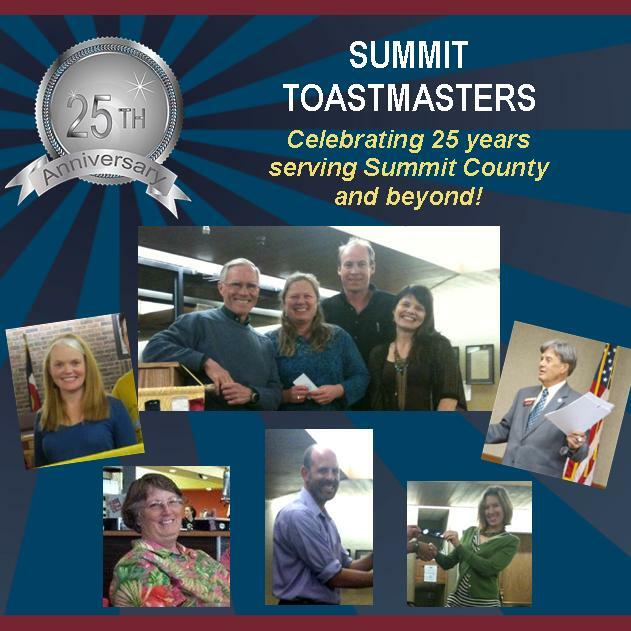 The District 26 Toastmaster of the Year is selected from ~3,000 members across Colorado, Wyoming, and Western Nebraska. The selection process starts at the club level, moves up to the Area, then Division, and finally the District level. The surprise announcement was even more so as I knew that I had not made it past one of those levels! The outgoing District Governor, then Mr. Norm Frickey, made the final selection. The honor is bestowed upon a member for Exceptional Leadership and Devoted Service. For those who would like to know a little of what lead to my nomination and selection, I have provided a pdf version of the article in the District Dialogue and a copy of the article by Connie Akins below. It’s the District Conference Hall of Fame Luncheon, and it is almost time to announce the Toastmaster of the Year award. Alan Swartz and his wife,Connie,are whispering up a storm at their table. “Who do you think it will be this year, honey?” whispers Connie. Set up officer training conference calls to make sure all her club officers were getting trained. She’s been working with all her clubs to help each one build membership and PR programs. Made up a One-Sheet with all the clubs and their contact info to hand out to groups and individuals that might be looking for a club to join. She made up an F-1 calendar based on the District calendar to help her clubs get connected into being a part of our whole District. On top of all of that, Yvonne would get the names from Tom Hobbs of people who were interested in starting new clubs and call them and help them understand the process. “Yvonne better win! I can’t imagine anyone who deserves it more. Plus she is the nicest, kindest person!” whispers Connie one last time. Yvonne Bryant is a nationally recognized leader and consultant who enjoys speaking and training Executives and Entrepreneurs. She is based in Colorado where she operates her Executive Coaching and Business consulting practice, Motus Design Group, llc. Yvonne was recognized as the 2011-2012 District 26 Toastmaster of the Year for Colorado, Wyoming and Western Nebraska. This entry was posted in General, Leadership and tagged Alan Swartz, Connie Akins, District 26 Toastmasters, Norm Frickey, Tom Hobbs, Yvonne Bryant. Bookmark the permalink. Guests are always welcome to come visit our fun loving club! Meeting: 6:30 pm to 7:45 pm.